Pamco, the successor to the National Readership Survey, has launched its new measurement currency which covers all publisher platforms for newsbrands and magazines. The new data currency, which has been in intensive development in consultation with the industry, will (for the first time) incorporate phone, tablet, desktop and print platforms for publishers. Besides measuring publisher brands reach across each of these mediums, the new measurement also combines and de-duplicates the data to introduce a total brand reach across all platforms. Overall, the UK's newsbrands and magazine titles have a total market reach of 48,114 per month. digital world where the way readers consume their media is changing at an incredible pace," Jan Gooding, chair of Pamco said. "The new data offers greater visibility and accountability to both publishers and advertisers, giving the industry renewed confidence in its advertising trading currency." The new JIC draws on the latest passive measurement techniques, combined with 35,000 face-to-face interviews. "Having one single de-duplicated view across all platforms has been top of our wish list for many years and Pamco has delivered this to the benefit of publishers, their media agencies and advertising customers," Paul Bainsfair, director general of the IPA, said. For Time Inc chief executive, Marcus Rich, the new metric will provide the title with a "robust rationale" for including all its publisher platforms in agency pitches to clients. A heartening finding from the new study is that reach of publisher content among young audiences is high, with 93% of 15- to 34-year-olds viewing published content each month, Simon Redican, chief executive of Pamco pointed out. "We are confident that Pamco will reveal further insights as users explore the data", he added. In total, the UK's newsbrands have a total monthly brand reach of 46,071 with the highest reach still residing in print (31,559 per month) followed by phone (28,200), desktop (17,306) and tablet (9,460). The Guardian leads the quality titles with a total brand reach of 24,823 a month, leading the other titles on phone (15,969) and desktop (8,728). It is closely followed by The Telegraph with 23,692 a month, which trumps the other titles in its monthly tablet readership (8,728). The most-read quality title in print, however, was The Times with a monthly readership of 5,417. 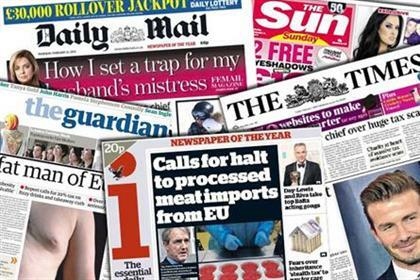 Of all the newsbrands, The Sun has the highest total brand reach at 33,322 per month, followed by mid-market newsbrand, the Daily Mail with a reach of 31,215 per month. Magazine brands clocked in a total monthly brand reach of 35,999 with print as its strongest medium (25,848) followed by phone (17,309 ), desktop (8,309 ) and tablet (5,236). Among the women's magazines, monthly titles BBC Good Food and BBC Easy Cook led with monthly readership figures of 10,970 and 10,664 respectively. Both titles have the strongest reach via phone with identical reach of 7,663 a piece. The next strongest women's title is OK! which has a monthly total brand reach of 5,724. It is the strongest medium by a hair is print (2,441) followed by phone (2,437). Leading the general magazine titles is Radio Times with a total brand reach of 8,178. The title's best-performing medium is the phone (4,722) with print trailing in second place (1,973). In second place is Time Out which has a total brand reach of 5,122. It is also the most-read via phone (3,067) followed by desktop (1,399). ** The combined figures for The National are net readership figures for Birmingham Mail, Hull Daily Mail, The Chronicle (Newcastle), Coventry Telegraph, Derby Telegraph, Evening Gazette (Teesside), Express and Star (West Midlands), The Herald (Plymouth), Lancashire Evening Post, Leicester Mercury, Liverpool Echo, London Evening Standard, Manchester Evening News, Nottingham Post, Bristol Post, The Sentinel (Staffordshire), Shropshire Star, South Wales Echo, South Wales Evening Post, The Star (Sheffield, Doncaster), Yorkshire Evening Post, Portsmouth News and Sports, Daily Record, Cambridge News, The Daily Echo - Bournemouth, Oxford Mail, Southern Daily Echo, Swindon Advertiser, The Argus - Brighton and York - The Press.